In any casualty situation, you will concentrate on maintaining the ABCs (discussed in the "Basic Life Support" section of chapter 9 in Dental Technician, Volume 2, NAVEDTRA 12573) of the casualties. In your primary assessment, you will notice some obvious conditions that require treatment (e.g., external hemorrhaging, shock, fractures, wounds, etc.). After you triage the casualties, you will start treatment of the obvious conditions. Hemorrhage, or bleeding, occurs whenever there is a break in the wall of a blood vessel. Blood circulates throughout the body by means of three different kinds of blood vessels: arteries, veins, and capillaries. Arteries are large blood vessels that carry the blood away from the heart. Veins are large blood vessels that carry blood back to the heart. Capillaries are smaller blood vessels that form a connecting network between the arteries and veins. Arterial bleeding is when bright red blood comes from the wound. If the artery is near the surface of the body, the blood will spurt out each time the casualty's heart beats. If the artery is located deep within the body, the blood will flow from the wound in a steady stream. Venous bleeding is when dark red blood comes from the wound in a steady stream. Capillary bleeding is when dark red blood comes from the wound in a steady stream. Slight wounds usually cause only capillary bleeding. This bleeding can be controlled by lightly fastening a sterile dressing over the wound. Deeper wounds, however, may cause venous or arterial bleeding. Because the veins and arteries are large blood vessels, a casualty may lose a lot of blood. You should regard venous or arterial bleeding as a serious, life-threatening emergency. The four methods for controlling hemorrhage are direct pressure, elevation, applying pressure to the pressure points, and the use of a tourniquet. Apply a tourniquet only as a last resort. DIRECT PRESSURE.- In most cases, serious external bleeding can be controlled by applying pressure directly on the wound with your hand on a sterile dressing as shown in figure 13-1. A battle dressing is a combination dressing and bandage in one unit. It is made of many layers of gauze sewed to a muslin strip or strips. Emergency medical kits are supplied with battle dressings (fig. 13-2), each stored in a sterile package, ready for instant use. These dressings come in different sizes; select a size to completely cover the wound and extend at least 1 inch in every direction beyond the border of the wound. Make sure that the sterile side covering the wound does not come into contact with your fingers, your clothes, or other unsterile objects. 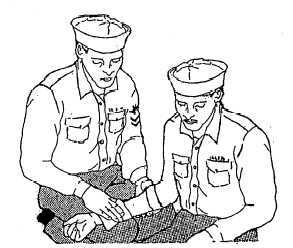 Do not drag the dressing across the casualty's skin, or allow it to slip out of place once it has been positioned over the wound. When the dressing is in place over' the wound, apply pressure to the dressing with the palm of your hand. Maintain pressure until the bleeding is controlled. If blood soaks through the dressing, do not replace it; add a second dressing on top of the first one and maintain hand pressure. When the bleeding is controlled, wrap the ends of the dressing around the wound and secure them by tying or pinning. Figure 13-1. - Direct pressure.